The Portland family of corbels / brackets are laser cut from steel and offers a very simple and clean design, perfect for modern, contemporary or industrial applications. These corbels / brackets are typically used as countertop support, mantle support & kitchen hood supports. 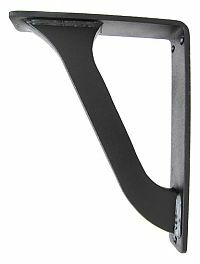 They’re also used as shelf brackets, they’re used underneath mailboxes, window boxes and balconies. They can be used on pergolas, to support porches and used as support for bathroom vanity applications. 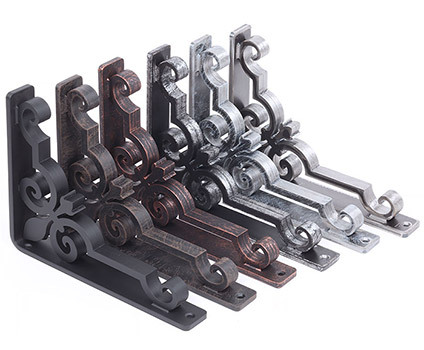 Not only are these brackets very well made and beautiful, they’re easy to install. Refer to the installation tips as a guide for your application. All sizes come with a laser cut 1/4” thick steel back-plate that has slightly rounded corners and precision cut holes that are countersunk to allow for flush-mount installation of hardware. 6 finishes to choose from, as well as the option to order them as unfinished. There are multiple depth, height and width options to choose from. They can support up to 150lbs each if installed properly. Each one is “Made in the USA".